When it comes time for highway driving in your SUV, crossover or even minivan, the Cooper Discoverer CTS tire was designed with you in mind. The Discoverer CTS exhibits characteristics needed for solid highway performance. It all begins with Cooper’s R-Tech construction. The abbreviation R-Tech denotes response technology, which is an advanced feature that Cooper has incorporated into this particular model. Whether you are on dry or wet surface you need not worry about stability due to a five rib design on the tread of the discoverer CTS. The ribs, along with the silica compound, greatly enhance traction on wet surfaces, making it one of the best tires for wet pavement in its class. It also promotes more even wear on the tread which leads to better overall longevity of the tire. Cooper has incorporated an optimized polymer mixture, which allows the silica compound to retain its abilities even at low temperatures. That aids in gaining increased traction in cold weather. It also results in a lower rolling resistance which in turn gives better fuel economy. Cooper has added an extended bead filler, which improves handling and lets you take hard corners even at higher speeds. The Discoverer CTS is available in a choice of outlines and also allows you to choose between white letter and a black sidewall, thus giving you the ability to customize your tires. Overall, the Cooper Discoverer CTS tire is a premium touring tire that drives and rides exceptionally well on the highway, regardless of whether the roads are wet or dry. The ride quality is what you would expect from a tire in this class. The 70,000 mile warranty provides good value for the dollar. 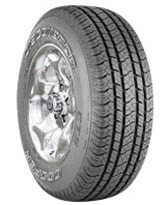 Prices for the Cooper Discoverer CTS Tire are about $225 for the 18 inch tire. Who Are Cooper Discoverer CTS Tires Designed For? The Cooper Discoverer CTS tires are designed for drivers of crossovers, light trucks and SUVs who want a tire that provides excellent driving and riding capabilities in all types of road conditions. Cooper backs up the Discoverer CTS tire with a 70,000 mile tread wear protection limited warranty. There is also a 45-day test drive guarantee.